brandflakesforbreakfast: Hi, nice to meet you! Since there is an app for just about anything, actually having human conversation has almost gone extinct. Nescafé Italia tried to change that. During Milano Design Week, Nescafé Italia created the "Hello Bench" and placed it near their coffee stand. With a built in sensor, the bench shrinks causing the people sitting on the bench to be right next to each other. Their goal was to get people to drink Nescafé coffee and start a conversation with the person sitting right next to them. 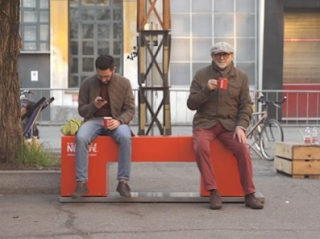 Nescafé Italia nailed the idea of interacting with their customers in a fun way that created a memorable experience.